Opened last week after extensive renovations, Střelecký Ostrov is a magic place to admire Prague’s beautiful topography and architecture from a completely new perspective. Access has been improved, particularly with the addition of a lift and for families the new obstacle course playground is a real drawcard. Střelecký Ostrov translates as Shooters Island - a name that truly reflects it’s rich history. In the 12th century during the reign of Charles IV, residents of Prague were allowed to practice shooting bows and crossbows into the river. For centuries of instability, the island was strategically important territory and during the struggle for power the island was the site of many battles as various armies captured and recaptured it in order to retain power in the Old Town. In the 18th and 19th centuries the island once again became a recreational area for shooters as well as various folk celebrations, thankfully shooting was banned in 1913. 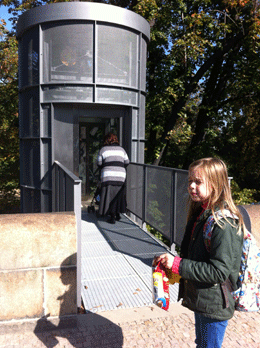 The park can now be accessed from both sides of the bridge, one side has the stone staircase, the other side has a new lift that allows easy access for everyone, particularly those with prams and wheelchairs. There are new, clean public toilets built into the bridge pylons and lovely crushed rock pathways that meander along the edge of the island. Currently there are signs up asking you to keep on the pathways, but it looks like everyone will be allowed access to the lawns next year as there is new bench seating installed in the middle of the lawns. I think this rule is so that the lawns can establish before the harsh winter. 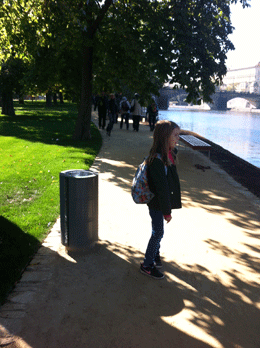 There will be lots of nice spots for picnics next summer! Over the years the island has hosted open air music and cinema festivals, but outside of these events the island had become a squalid home to many drifters. I took a walk here last year shortly before the island closed for renovation and the stench of urine underneath the bridge was truly horrific, there were several extreme backpackers on a budget who were temporarily camping out on the island over the summer season and had hung their washing all over the trees and riverbanks, as well as an assortment of some seriously doped out individuals. They were probably all harmless but it wasn’t the nicest of places and felt kind of dangerous. Post-reno, the council has well and truly ‘seized’ the island, it is now locked after 10pm in Summer and 7pm in Winter (outside of events) and has CCTV installed in several locations. Camping, fires, alcohol and drugs are all banned. I question where the drifters will head to next? Anyway, the island is now utilised and enjoyed by tourists and locals alike and the installation of the obstacle course playground will bring in the kids too. 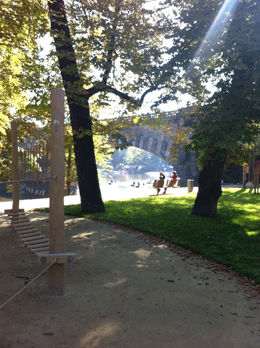 The playground is not your typical swings and slide type play area. This may have something to do with the threats of flooding. The whole island went under during the June floods - thus the delay in opening. 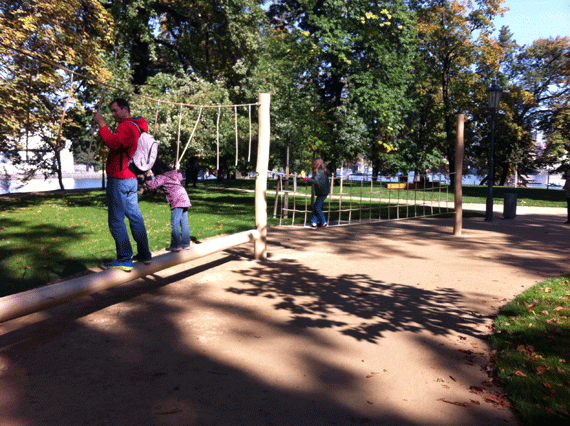 A fun obstacle course made of wood, ropes and chains had all the kids challenged. 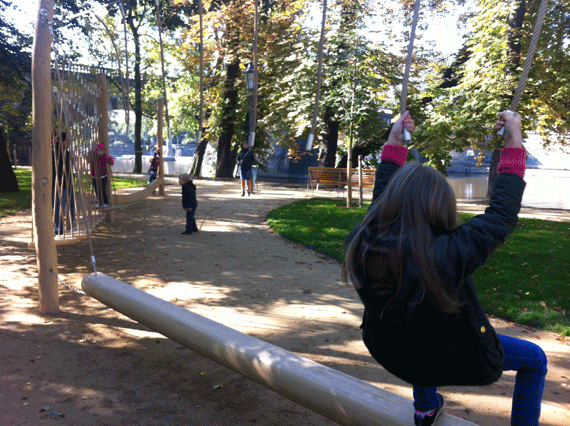 One side is lower to the ground and suited to younger kids, the other side for older kids. 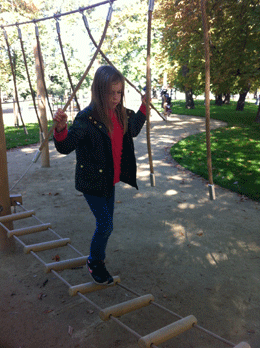 Lucinka really enjoyed the course and found it quite difficult in places, the suggested age range is 3 to 15 years. If you’d like to visit a more traditional playground afterwards then you are spoilt for choice as there is Detsky Ostrov (Children’s Island), Slovansky Ostrov and Kampa Island playgrounds all less than 1km from the island. The restaurant/cafe on the island is shut - firstly closed by the renovations and then extensively flooded in June. I am sure it will reopen in the future, the location is just too good and the rejuvenated park will bring an increase in visitor numbers. Next door to the cafe/restaurant is the entrance to tennis courts. For any families with children interested in tennis lessons in English or Czech I can recommend Petr Štěpánek, an experienced tennis coach who teaches at this picturesque location. DIRECTIONS: By Tram: Take tram numbers 6, 9, 12, 20 & 22 to Újezd tram stop or 17 or 18 to Národní Divadlo. Metro: Closest metro is A line to Malostranská. 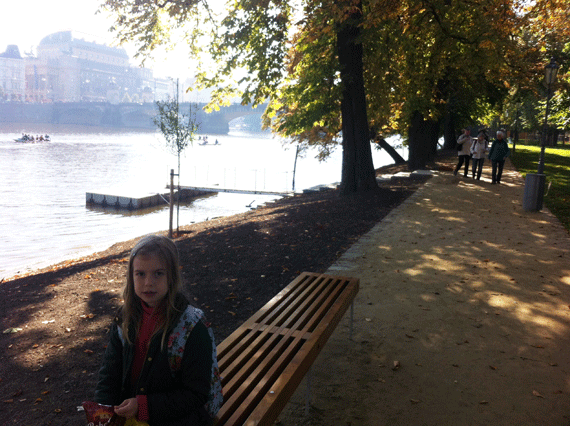 By Car: There are no parking restrictions in Prague 5 close to the river.